When your car breaks down, it’s obvious that you have a choice in your mechanic. Just as you have a choice in where we get our haircut, or where we have our teeth cleaned. Did you know you also have a choice in who will provide your physical therapy services? For anyone, including a physician, to state that you have to see a specific provider is inaccurate. You have a right to choose who provides your therapy, your x-rays, even your lab work. Your physicians can recommend someone, but ultimately, you have a choice! Per your health insurance contract, you have the right to receive health care related services where you want. If you seek care from a provider that participates with your insurance, your costs will be lowered. It should be noted that your insurance carrier has no obligations to a single medical office; their obligation is to you so you can get the very best in healthcare. Our health care environment is changing in the Holland area. Inform yourself. You should call around and speak with different physical therapy companies to find out how they can help you. Go with the company that answers your questions and seems truly interested in assisting you back to health. You do not have to seek care from the same person your doctor recommends. You can even go to a different provider than is listed on the top of the prescription that the doctor gives you. At Full Potential Physical Therapy, we accept all PT scripts regardless of whose name is at the top. In addition, you may ask your doctor for a referral to a clinic of your choice. 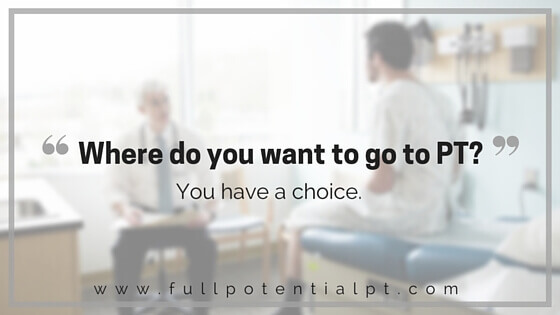 The appropriate statement from your medical office should be, “Where do you want to go for PT?” Because the referral process may not be presented as clearly, we want you to know you have a choice. Share this information with your circle of friends and family if they should need PT. It is your body, your money, and your insurance contract; so exercise your right to choose.